My friend Hillary e-mailed me today to let me know our bridesmaid dresses are in and we are meeting her on Thursday night to look at them and work on getting the dresses taken in or let out. I'm praying my dress fits. I ordered it several months ago before I knew I was pregnant but I had ordered it several sizes big "just in case". It's a really pretty dress so I'm excited to wear it. I was thinking about the different weddings I've been in over the years and the different dresses I've worn. I love weddings and it's always fun to be in the wedding party. I think I've been in 8 weddings? And I was a flower girl twice. How many weddings have you been in? And what was your favorite bridesmaid dress? 10...I think! And your dresses were my favorite. Seriously! I just loved it! I love your wedding dress, so pretty! I have been in 8 weddings as well. My favorite dress was a long red one I wore in my cousin's wedding a few days after Christmas...it was so pretty to see the red dresses with the holiday decor. I have been in 3 weddings, not counting my own! My favorite dress was def. the purple one I wore in my friend Tasha's wedding. I LOVED my wedding dress, I wish I could wear it to more things....silly I know! Four, for me! I just love a good wedding!! 8 and counting! I've got one in a few weeks and then one next summer. I have only been in one wedding. It was for my youngest sister. She had it planned for the end of March, and then I found out I was pregnant! My due date was March 28th. So because she is such a wonderful sister, she changed the date of her wedding just for me. My little boy ended up coming exactly on his due date. I love your bridesmaids dress! I wish I would have done brown at my wedding. You were a beautiful bride! I hated my hairstyle..I looked like an old woman...at 22. I really liked your hair color in the red dress. It must be really nice to have such great, close friends. I didn't really have that. I was only in my sisters wedding and I was 16 and the dress was not that pretty...one with big pouffy sleeves (shoulders) and teal green! Funny though..we just got home from a bridal shower and my youngest is the flower girl in this wedding. 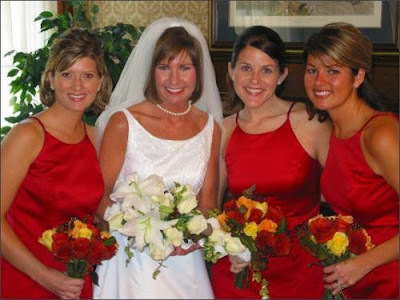 I've been a bridesmaid (what do you call it if you are married but not the matron of honor? bridesmatron?) 3 times. Can't say I was thrilled with any of the dresses. Probably because I made them myself. I think two. You could SO do the inverted bob!! I have been in 8 so far ... my favorite was the last wedding I was in. The bride graciously let us all pick between 8 different dresses, but they were all the same color. Her theory was that we were spending good money on the dress, therefore, we should have a style we would be comfortable in and wear again! They were all a bronze color, like what your bridesmaids wore. VERY flattering on everyone! I have been in 9! I think I am just about done!!! You're wedding looks beautiful! Definitely not as many as you!! Only 2!! Those pictures were fun to look at! Too many to count. I think we have the majority of our friends married but I still have my brother and all my cousins to go. My husband and I have decided, after a wedding this summer, that we are only going to be in family weddings from now on. It can be such an exhausting job! You look great! Love the pregnancy pictures! i've been in 11 so far (counting my own ;-) 10 as a bridesmaid...one as the bride. never been in a house party though. never thought about that. but i also still have a sister that is yet to marry...but probably will soon. my husband has been in a ton too and he still has friends getting married! we rejoice lately if we just get to be "guests" at weddings! but i'm thankful for having so many close friends...i had 11 bridesmaids myself! I've only been in 1 wedding...it was my Dad's...I was the flower girl. But...I'm planning my own wedding...and picking out the bridesmaid dresses right now...fun fun! 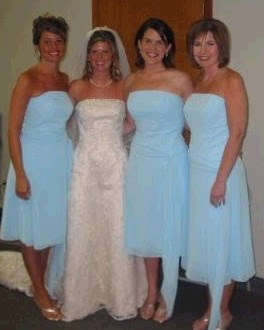 My favorite bridesmaid dress was my friend Melissa's...it was a pretty champaigne color. I love your bridesmaid's dresses...love the color! You look pretty in every dress! I think I've been in eight, too. I really liked the bridesmaid dresses Kandi picked. I think that was one of my favorites that I wore. I can't wait to see what Hillary picked out for you. I know it will be perfect and you will be beautiful with your little baby bump. November wedding, huh? We got married in November too. I love the fall colors, plus I was able to combine Thanksgiving holiday days off with vacation! We got married on November 21.....how about you? I've only been in 4 weddings as a bridesmaid. I think my favorite dress was a strapless black one...I can wear it any time I have something formal for work! Being a girl that got married in the early 90's....bridesmaids dresses have come a long way!!! I have been in 4 wedding in the past year and a half! Its always fun to be a part of the wedding party but boy can it be time consuming and expensive!!! You were a gorgeous bride by the way. I refered to you in my very first blog post ever ... check it out! I thought it was finally time to leave a comment! I just got married in June, and I was the first of all of my friends to get married, so I haven't been in ANY weddings...unless you count being a Junior Bridesmaid at my aunt's wedding when I was 10! :) I hope I'll be as great of a bridesmaid as mine were when the time comes! It's been 13(hopefully no more before I can actually BE the bride for once)!! Luckily for me, I have a ton of very fashionable friends, but my all-time fashion statement was a wedding I was in were we wore muffs down the aisle instead of carrying flowers. Ha! And such a sweet photo of you and your baby's bump. I pray you continue to stay well and enjoy this precious time. Hillary's wedding will be my 10th. I sure liked your dresses a lot! I love halters. I've been in three weddings. From the pictures you've posted, I'd say you've been very lucky to have pretty bridesmaid dresses. I have not been so lucky. I don't have a favorite, but the worst one was burgundy velvet. And, I don't think I need to say any more than that. I was in 7 and my favorite was when my high school best guy friend asked me to be a groomsmen...his wife picked out the most beautiful black dress for me. I still have it and love it! Can't wait to see what Hillary's dresses look like! Your 1/3 of the way to 27 Dresses. I LOVE LOVE LOVE your bridesmaids dresses!!!! I always think brown looks so great at weddings. Believe it or not I've only been in 2 weddings...and one was back in the 80s where I was the flower girl and had to wear a turquoise, poofy sleeved short dress! I will be a Matron (how exciting) of Honor in one of my best friends wedding shortly after I get married! Wow! I have been in 7 weddings including 2 flower girl twice. Being a bridesmaid is very fun! Busy though! I have sang in about 3 weddings also. Thanks so much for visiting my blog. You and your mom inspired me, though I'd been wanting to give it a try for some time. I just hope I can keep up with it. So glad to learn that things are progressing well for you and Baby H. I can't wait to hear all about your upcoming ultrasound! It's such an exciting time...enjoy every second! I've only been in a couple of weddings, and didn't like my dresses for any of them. One funny thing that happened in one of the weddings I was in...we got to the rehearsal and the wedding director told the maid of honor to come stand up front and pointed to me...I said "No, I'm just a bridesmaid" and she said "it says that you're the maid of honor" It was in the program and everything and I had never even been asked by the bride or knew anything about being the made of honor! What in the world?!?!?! I still laugh about that one! Can't wait to see Hillary's dresses for y'all! Okay - since belle and her beau admitted she was a first time commenter but long time lurker, I will admit it also. I stumbled upon your blog a couple weeks ago and I love checking in. You have great posts! To answer the question. I have only been a bridesmaid in one wedding (liked the dress then)I've been in the house party for four weddings. I have been in 7 weddings! 8 if I include my own :) My favorite dress was the one that I was able to use twice. My cousin & a friend just happend to choose the same dress! Worked out perfect for me! 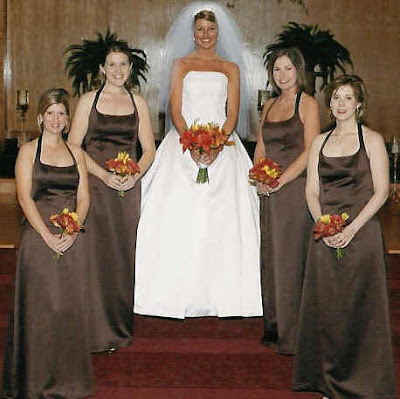 you were a gorgeous bride..i love those brown dresses too! Although I am not that crazy about weddings - What guy is? (Except for maybe a few of the grooms) I have been in over a hundred weddings. Not as a bridesmaid, I did the weddings. But I have to say that your wedding was the best. Nothing like walking your daughter down the aisle and then officiating at her wedding. Chris' wedding would tie for the best. I loved being his best man. Truly an honor! Love your wedding picture - so pretty! I am a newlywed and I LOVE weddings. My dream is to be a wedding planner like Jennifer Lopez one day :) I have been a bridesmaid five times and a flower girl once. Love your blog! 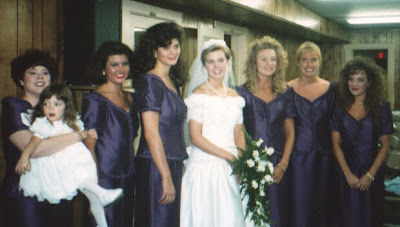 My favorite bridesmaid dress was the purple one I was wearing when I met my husband, one of the handsome groomsmen! 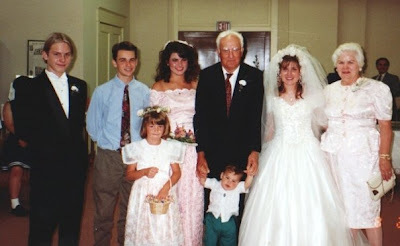 I love the 80s-90s wedding pics...oh the good memories! I just read what your dad said and can I say...HOW SWEET ;)!!! I have only been in three weddings...1 as a flower girl and two as a bridesmaid. My friend Christen got married last June and I loved her dresses ;)! Can't wait to see pics of Hillary's wedding! Could your dad be any sweeter?? I don't suppose you want an adopted sibling ;) How neat that your dad married you!! I've been in 3 weddings. THIS is the summer of weddings. Up until a few weeks ago, I had FIVE or SIX invitations on my bulletin board. LOVE your dress and your bridesmaids dresses. I have been in 6 weddings and I have a tie for a favorite dress. My friend Lauren had beautiful long gold dresses that were fabulous, but I wore a short, black strapless J Crew dress in my friend Mary's wedding a year ago that has already been worn again twice! I had 9 bridesmaids (gasp, I know!) and they all loved their two piece dark purple dresses. Some wore the tops again with jeans or black pants. Very versitile! I am just reading your blog for the first timme.. I noticed you have a November anniversary. my husband and I got married. November 3, 2001. Can we be added to your miracle board for people whow would love a child? WE have been trying for nearly 7 years. (it will be 7 years memorial day weekend)We were prophecied to that we would have a child. But the doctors say it is not possible But we know a god who does exceedingly abundantly above what we see or know. I am struggling a bit because I am in end stage renal failure. But... the promises of God are Yea and amen.. right?